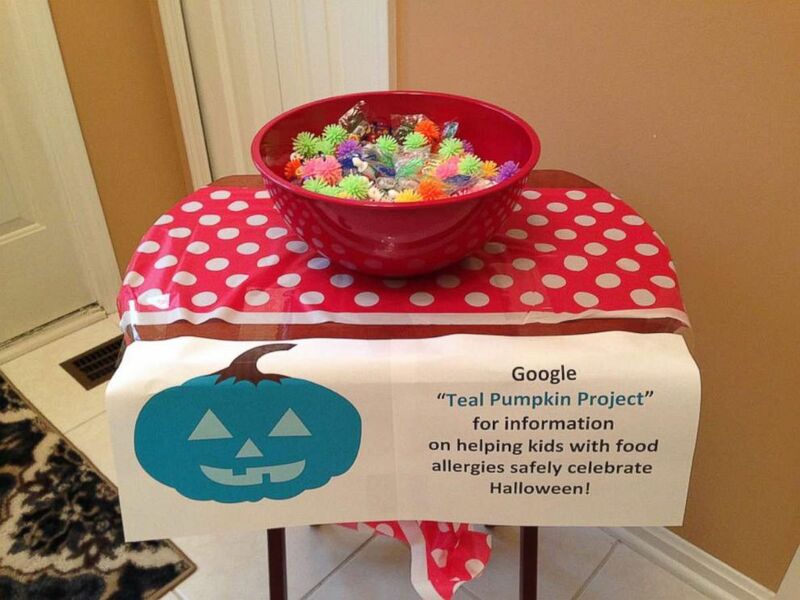 The nonprofit Food Allergy Research and Education (FARE) group launched the Teal Pumpkin Project in 2014 to raise awareness about food allergies and to let trick-or-treaters know which houses are offering non-food treats. According to the Centers for Disease Control, an estimated 4 percent to 6 percent of children in the United States are affected by food allergies, and some reactions can be life-threatening. Over the past three years, the Teal Pumpkin Project has spread across the country, thanks largely to social media, Nancy Gregory, the senior director of communications for FARE, told ABC News. "We continue to see the campaign grow and the feedback from then to today has always been overwhelmingly positive from both people in and out of the food allergy community," Gregory said. "In 2014, we created a participation map where people could add a pin to show where their participating homes were located in the community. Each year, the number of homes has grown and in 2016 we saw a nearly 80 percent increase in the number of people who added their pins to the map." FARE encourages parents to share their own stories and pictures on social media as well as adding their homes to its maps. Vikki Meldrum, a mom from Westlake, Ohio, told ABC News that discovering the Teal Pumpkin Project in 2015 helped her come up with a strategy to help her 4-year-old daughter Lyla -- who has multiple life-threatening food allergies -- enjoy and participate in Halloween. The Meldrum's treat table looks the same every year in which they offer non-food treats for kids. "Using the Teal Pumpkin Project as motivation, I reached out to every member of my neighborhood. I let them know about Lyla's food allergies, about the Teal Pumpkin Project and asked if they plan to give out candy and if they would be open to providing a non-food treat for Lyla," Meldrum said. "To our surprise and delight, every house participated that first year." FARE suggests that families who want to participate swap out traditional Halloween candy for inexpensive toys and other non-food treats such as glow sticks. The group sells starter kits on their website and offers free printable posters for those wishing to participate as well. Meldrum said houses put out teal pumpkins and other decor to let Lyla know she was welcome. "Vikki really embraced the project and knew that to make it successful in her own neighborhood she would have to spread the word herself and the stories about her daughter prove how open people are to the idea to help spread awareness," Gregory said of Meldrum. One first-time parent participant, Cheryl Drzal-McCormack from Wappingers Falls, New York, said she has heard about the project on Facebook and purchased a teal pumpkin to bring awareness to her community. "My middle son Aiden has a allergies to some foods," McCormack said. "I thought this was such an amazing idea, especially being a mother of four, and I'd never even thought about doing something like this until I read about it." McCormack said that while her son has never experienced an allergic reaction from Halloween candy, she's glad the project exists to help other kids with food allergies. She said she spoke about it with her friends and with the principal at her childrens' school about including it in their Fall Festival. "I hope that more parents are aware of this and think about the kids that cant trick-or-treat because they can't have the candy," McCormack said.